"You obviously care. There was something about the service. You didn't talk to us from up there. You talked at our level." When we have lost someone we love, it is hard. We are here to help you at this time, by listening and hearing you tell your story and that of the person you have lost. If you like, we will pray for you. If you live locally you have the right to have a service in your local church and be buried in the churchyard, or to have your ashes buried here if you prefer. We are happy to work with you on the service. You will need to contact a funeral director who will make all the arrangements for you. If any time after the funeral you would like a chance to chat, then give us a ring and we will arrange for someone to pop round. Also once a year in the Autumn we hold a service where we remember those we have loved and lost and there is an opportunity if you want to have their name read out and light a candle, followed by tea, coffee and cake. We will invite you automatically if we have taken a funeral for you, and you are welcome to attend if you would like to. If you would like to speak to us further, please contact us via the Contact Us page or on 01245 364081. When we have lost someone it is good to have a place to come to to remember them and people enjoy tending graves and making them look beautiful, and we strongly encourage this. Our churchyards are places of beauty and tranquility, and also important places for current and future generations. We want the churchyard to look good for everyone and it is a public space that we are managing on behalf of the Diocesan Chancellor who has the responsibility for all the churchyards and we are stewards on his behalf. 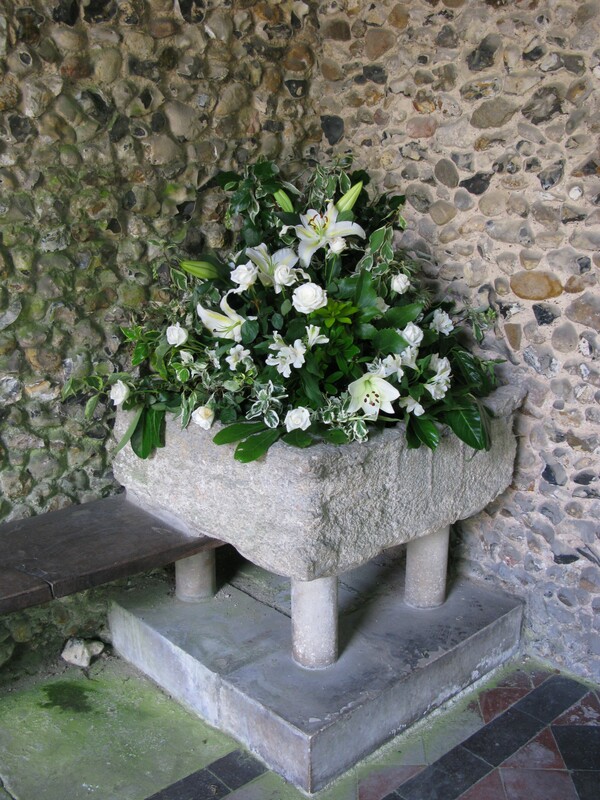 All our churchyards are open, which means that we are able to offer both burials and interment of cremated remains. We are governed by quite strict rules about what we can and can’t do and our intention is to be sensitive and understand that this is difficult, but we have to follow the rules. Who can be buried in our churchyards? There is a legal right for anyone who lives in the parish at the time of death, or who died in the parish or whose name was at the date of death on the church electoral roll of the parish, to be buried or have his/her cremated remains interred in the churchyard. If you choose a cremation, the funeral service can take place either in the church, followed by a short service in the crematorium; or the whole service can take place at the crematorium. The Vicar, curates or other licensed minister are available to lead either type of service, but this does need to be booked through your funeral directors. After the funeral your funeral directors will contact you to discuss how you wish to dispose of the ashes. In our churchyards we are only able to bury ashes: they can’t be scattered. We have a special place where this can happen in each churchyard. You will need to have a conversation with the vicar to assist you in making the right choice for you and your family. If you choose a burial, the funeral service will take place in the church followed by a short act of committal at the graveside. After the funeral at least six months must elapse before a memorial stone can be erected. There are strict rules about which kind of stone is allowed. A stonemason will be able to advise you and a form (CR1) comes to the vicar for approval. The words of inscription on a headstone are highly significant and care needs to be taken to choose appropriate wording. The inscription needs to be in English, names of the deceased must be written in full (if the person was known by an abbreviated name it may be added in brackets after the Christian name), the dates of birth and death are also included. The headstone is an opportunity to record in words something about the character or life of the person commemorated, so that future generations, both of the family in question and the public generally, will be able to read the testimonial and reflect on the life recorded on the memorial. Any quotation used on a memorial in a churchyard must be consistent with the Christian belief in life after death. An appropriate quotation from the Bible, or a suitable line from a hymn or poem may be used. The ministry team can help you with your choice in this regard. There is usually more flexibility in the case of a child, and the details of this would need to be discussed with the minister. Flowers, plants, trees and benches: Where a flower vase is included in the base of the headstone fresh flowers or cuttings from shrubs or bushes may be placed in the base. Some people think that they own the ground that someone is buried in, and this isn’t actually the case. It is lovely when people plant bulbs and small plants on graves, but no border or fencing is allowed. Trees in the churchyard are under the control of two separate agencies which work together to ensure a balanced environment for all trees to flourish. If you are thinking of planting a tree in memory of a loved one please contact the vicar in the first instance. In all circumstances permission from the local authority and a faculty will need to be obtained from the Chancellor before a tree is able to be planted. Great Waltham is in a conversation area so this means we have more rules to follow! The PCCs have a plan for the churchyards including benches. If you would like to install a bench this will need to be agreed with the vicar and the PCC and a faculty form will need to be filled in.